Mini or Full-size Options, Your choice! 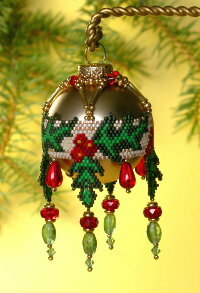 Peyote and Brick stitches combine to make one stunning ornament. Two repeats of the chart will decorate a mini glass ball as shown, the perfect size for those smaller branches near the top or even a table top tree. Or stitch 3 repeats to beautifully cover the popular larger size ornaments for lower branches. Color Numbers refer to Delica cylinder beads, size 11. There are approximately 200 beads per gram. Bead counts for small and large version in ( ).